Think about the scenario where a radiology practice has a great relationship with its hospital administration but then the leader or key players in that administration suddenly turn over, leaving the practice back at square one. The situation is not new or unique to today’s changing environment. Hospitals have recently dropped several radiology practices in what have become well-publicized cases in the imaging community. Hospital administrators are finding that teleradiology provides facilities reading options that were not previously available to them. So the question a practice must ask is can it improve its relationship and image with its hospital administrators and medical staff? The answer is yes, but not without making a concerted effort and planning for scenarios that are beneficial to both parties should an administrative change occur. A practice may need a new approach to building a relationship that can heavily impact its business. Customer service is as important to a practice’s success and survival as the quality of its medical care. Quality care is presumed and expected, so administrators usually don’t analyze it unless it is perceived as a problem. When discussing customer service, quality interpretations are not the driver; perceptions are. When a radiology practice encounters a change in a key hospital administrator, this can be viewed as both an opportunity and a potential threat. The incoming administrator will form new opinions and views based on personal observations, input from the remaining administrative staff, the medical staff, and various other sources. If a radiology practice leader is not part of the group influencing and educating the new administrator about radiology, then the practice’s fate may be left to the winds. The question therefore becomes how can a practice work with its hospital to build relationships before and after an administrative shift? • realize that customer service is a function of business survival and should be viewed separately from the clinical practice of medicine. Many radiologists do not count customer service programs and relationship building as part of what they most enjoy, which is practicing medicine. This can be the root of a business dilemma for many groups. Radiology, like other hospital-based medical specialties, is more like other businesses than most medical practices. Diagnostic radiologists have no direct patients and therefore are wholly dependent on referrals from other specialties, as is a hospital. Therefore, radiologists have more in common with the hospital than they may know. If the hospital does poorly so will the radiologists. So how can the advent of a new administration offer opportunity to a radiology practice? • Meet and greet: A radiology practice and its staff should get to know its new administrator with an “arm around the shoulder” as opposed to an across-the-table meeting. Tone is everything, so radiologists should set the proper tone when first meeting a new administrator, and avoid confrontation if at all possible—even though there may be many issues radiologists want to see resolved in the department. For example, maybe there are problems with support staff, equipment upgrades, or transcription turnaround times. At the first meeting, none of these problems should be presented. The best approach when meeting someone who can effect change is to refrain from bombarding him or her with the problems. The new person is likely inundated with information and will appreciate a hospital-based practice that shows understanding and patience. Relationship building and patience are two valuable components to effecting change on both sides. • Put the hospital first: A new hospital administrator will be most receptive to a radiology practice that understands the hospital’s needs, not just its own needs. 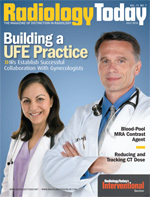 This illustrates that the radiology practice is willing to work with the hospital as a partner. When it is time to discuss the operations of the radiology practice, approach is everything. Administrators, like physicians, have their own goals, interests, issues, and biases. Showing genuine interest in helping the administration and finding solutions to its problems can go a long way. Of course, this approach may not solve all problems, and the suggestion that a radiology practice should do whatever the hospital administration asks of it, regardless of whether it is in the interest of the practice, is not ideal or realistic. However, the communication process and the perceptions that come from communication are critical. Consider the situation where a radiology practice needs an upgraded CT scanner. Rather than launch a conversation suggesting the need for an upgraded CT scanner, practice leaders can conduct behind-the-scenes research showing the ways a new scanner would impact revenue per procedure. Because hospital administrators tend to be analytical and see benefits in facts and figures, radiologists can present information to help the parties see eye to eye. A radiology practice leader who illustrates that he or she is a valued consultant and ally to the hospital’s administration will provide lasting benefits and open communication for both parties. Radiologists are typically great teachers, specifically when training future radiologists. That same skill set can and should be used when working with hospital administration and the medical staff. If a practice learns to approach problems as an educational opportunity, it will typically have far greater levels of success than other, more confrontational approaches. As with all communication, presentation is critical. Educational recommendations perceived as condescending will likely fail to achieve the desired results. Education does not stop with hospital administration. Showing the medical staff the radiology practice’s worth by educating them on the value of certain procedures and equipment will not only improve the practice’s standing with most staff members but can also be a valuable resource with administration. In those instances where education and logic fail to persuade administration in the practice’s favor, support from other members of the medical staff will be invaluable and may turn the day. However, radiology practice leaders should be careful about how the group portrays the administration to others. Understanding the other parties’ issues in a discussion is vital to showing respect for their position, even if a disagreement arises. In conclusion, working with a new administration should be viewed as an opportunity to re-create or reinforce a radiology practice’s image. The approaches previously discussed should also be used when dealing with long-standing staffers, but with a new person, preconceived issues may not be as difficult to overcome. There is always a risk that the new administrator will arrive with a negative view of radiology due to a previous position. In that situation, if a radiology practice does not illustrate that it is different from the administrator’s previous experience, it could suffer for the problems created by another practice in another place. There are many reasons practices lose their hospital contracts, but practice leaders should never be convinced they lack the ability to impact those decisions now or in the future. The practices that survive will know they are dispensable and understand that customer service is comprised of both good communication and compromise. The practice of radiology is in the midst of many changes. However, the one thing that will never change is the survival of the practice that meets its customers’ needs. Practices that understand who the customers are and what they need while also communicating with their hospital’s administration, educating them, and communicating a real desire for mutual success will stand a better chance of building successful relationships to enhance business growth and opportunity. — David A. Myrice, CPA, MBA, is a senior finance manager with Medical Management Professionals, Inc. He has specialized in business financial operations since 1981 and is a certified public accountant and a licensed nursing home administrator.